There is no hush like the peace before a bagpipe procession. At 10:28 a.m. on May 21, thousands of parents, alumni, and friends quietly stood and turned in unison to the back doors of Sanford Field House. The silence was broken by the sound of the Mohawk Valley Frasers, whose sonorous pipes and insistent drums led more than 700 Colgate University seniors and their beaming professors to Commencement 2017. With traditions stemming from 195 prior graduation ceremonies, the university conferred degrees on the singular Class of 2017. The event marked the final moments in a celebration that began the morning before with brunch for the class’s first-generation graduates and an initiation ceremony for 41 seniors who were elected to Phi Beta Kappa. The evening of May 20, seniors, along with their families and teachers, gathered in Memorial Chapel for the annual baccalaureate service. The Rev. Gayle Fisher-Stewart, associate rector of Calvary Episcopal Church in Washington, D.C., and founder of the Center for the Study of Faith in Justice, addressed the class, calling on them to be prophets for a new age. A cappella concerts, a torchlight procession, and receptions rounded out the evening’s festivities, setting the stage for graduation itself the following morning. President Brian W. Casey, in his first remarks before a Colgate commencement crowd, reminded students in Sanford Field House of another Class of ’17 — 1917 — whose selfless pursuits deprived them of their own graduation celebration. The Class of 1917 commencement ceremony was canceled due to the fact that three-quarters of the campus had been deployed to The Great War. Orange is the New Black and Jane the Virgin actress Diane Guerrero reflected on growing up as a child of immigrants during her keynote speech for Africana Women’s Week. Guerrero’s parents were deported when she was 14, but she didn’t let that dictate her future. Her speech, “Moving Past Survival: Healing as a Catalyst for Growth,” was in conversation with her recently published book, In the Country We Love. Guerrero said that she wrote her book for the millions of children who are in her same situation. An immigration activist, Guerrero said that last year’s elections motivated her to become more outspoken and involved. When she heard the rhetoric surrounding her community, immigrants, and other things that she held dear, like education, she knew that she had to act. “I wanted to be a woman who stands up for what she believes in,” Guerrero said. She now volunteers with the Immigrant Legal Resource Center, a nonprofit organization that educates immigrants about their rights. She also works with Mi Familia Vota, encouraging residents to become citizens and register to vote. Africana Women’s Week also included a poetry reading with Ijeoma Umebinyuo, a brown lag lunch with Art as Resistence: 3Realms Collective, and Night of Sisterly Love: SORT Sleepover. The events were coordinated by Sisters of the Round Table, a student organization that fosters sisterhood among women of color and their allies. 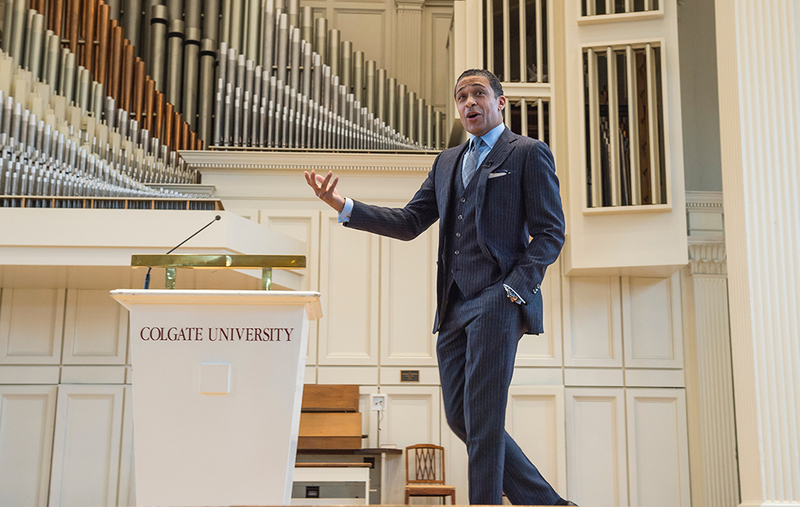 Bringing together students and alumni of color, Colgate’s first Mosaic Weekend on March 24 and 25 featured a keynote speech by noted ABC News anchor and correspondent T.J. Holmes. In addition, the weekend included alumni career panels, networking opportunities, and a reception with Holmes. Students were integral to the planning of Mosaic Weekend. 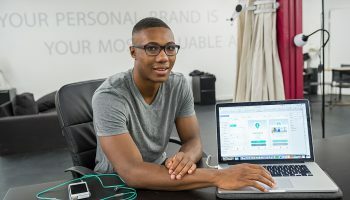 They coordinated with alumni relations and career services staff members to design alumni panel conversations around topics such as the transition into the workforce for graduates of color and industries with progressive hiring practices. 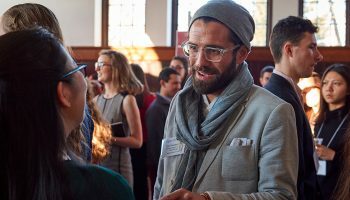 They also planned both formal and informal networking sessions — moments when they could discuss with alumni serious topics surrounding diversity and inclusion, as well as time simply to bond over shared Colgate experiences in a relaxed atmosphere. The weekend also included the first meeting of the Mosaic advisory board, which is composed of alumni, including representatives of the Alumni Council and the Alumni of Color organization, as well as students and staff members from several campus departments. The Mosaic advisory board will meet with campus representatives twice per year to provide ideas and feedback on matters such as student recruitment; student life, academic support, and career development; and alumni engagement efforts. Interested in learning more? 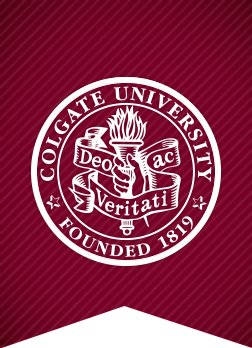 Contact Veronica “Ronnie” McFall ’89, who has joined the Colgate staff in the new role of assistant director of alumni relations for affinity and identity programs, at vmcfall@colgate.edu. If Grace O’Shea ’11 could describe her perfect work environment, there’s a good chance it would sound something like Colgate’s Thought Into Action Incubator located in the heart of downtown Hamilton. After all, its spacious layout, flexible seating options, and co-working environment are exactly what her spatial design company, room2learn, creates for its clients. Luckily enough, O’Shea spent the beginning of her summer in the incubator working to grow her company as one of the 2017 Colgate Entrepreneurship Fund winners. She belongs to one of five teams that received a $12,000 grant, mentoring, and use of the incubator space for the summer. The other winners included Patrick Crowe ’18, founder of Loophole; Rob Carroll ’15 and Nick Freud ’15, co-founders of Vision; Matthew Glick ’19 and Jack Zamore ’20, co-founders of Gipper; and Cody Semrau ’14, founder of BetterMynd. 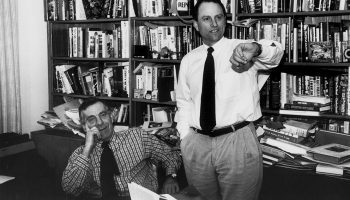 The fund was established in 2013 by Dan and Linda Rosensweig P’15, ’17 to support the business ventures of action-oriented start-ups that have at least one Colgate member on their founding team. 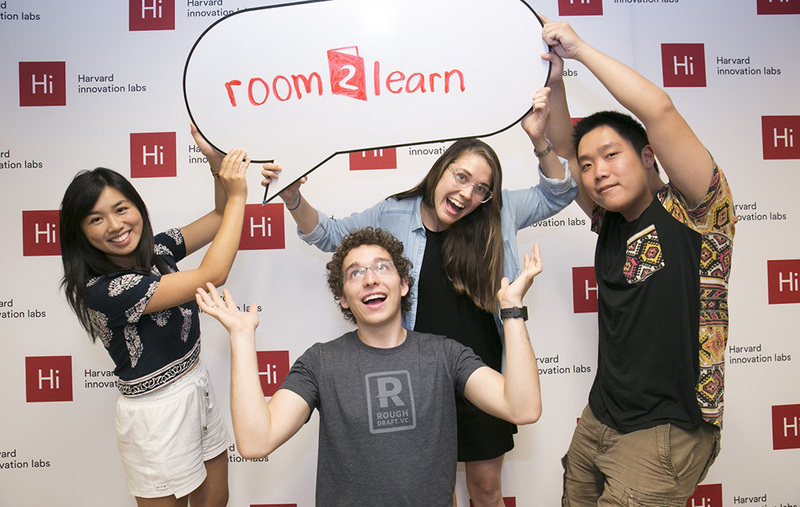 Founder Grace O’Shea ’11 (second from right) and her colleagues from room2learn, a company that provides custom-design solutions for school communities. She developed the idea for the company when she was working as an 8th grade science teacher and realized the need for more flexible classroom space. 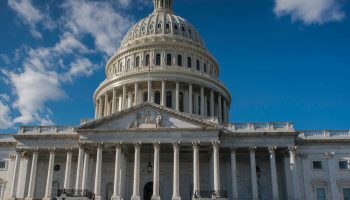 Although O’Shea and her team are still determining how they will allocate their funding, she said that the intellectual guidance they’ve received from alumni and professors is priceless. Successful entrepreneurism draws heavily on ways of thinking that are integral to a liberal arts education, explained Meg Blume-Kohout, visiting assistant professor of economics and TIA faculty mentor. 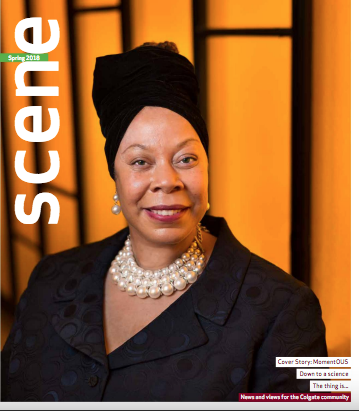 “The TIA student-entrepreneurs throw their hearts, time, and effort into creating something new, and for many of them, their venture is an expression of their own identity and social consciousness,” she said. A record number of alumni returned to the hill during Reunion Weekend 2017 — 1,850, to be exact. Also setting records were the classes of 2012 and 1967, which had 44 and 33 percent of their members attend, respectively. 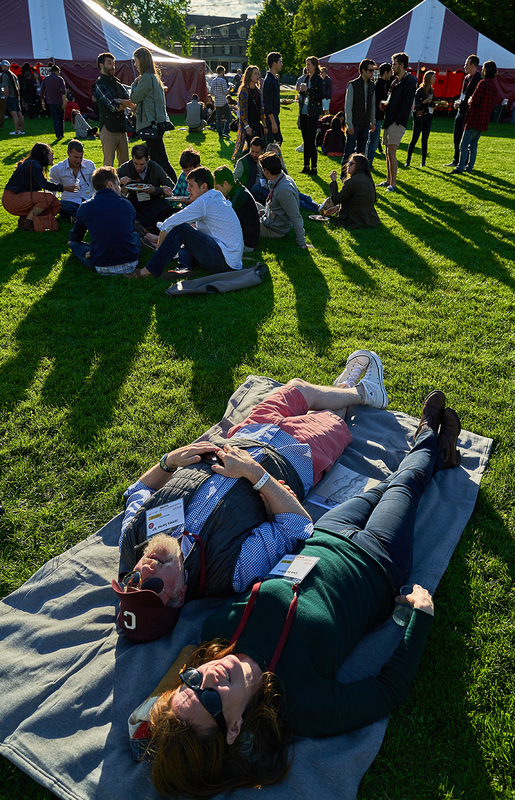 Throughout the weekend, campus was energized with alumni reconnecting, reminiscing, and story swapping. Here are some of the things we overheard. 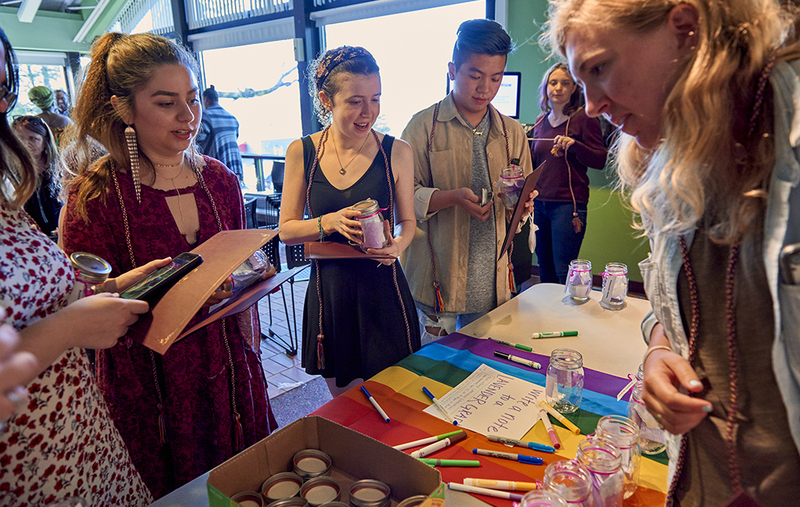 As the Class of 2017 prepared to don black robes for commencement, a rainbow celebration honored the LGBTQIA+ community during the Lavender Graduation and Awards Ceremony on April 27. Seven awards honored individuals and one group who have advocated for LGBTQ people, issues, and causes on campus. In addition, there were 28 Lavender graduates — seniors who identify as part of or provide support to the LGBTQ community. Rubey received this year’s Emerging Leader Award. An intern with Colgate’s LGBTQ Initiatives, Rubey spearheaded the effort to bring the Spectrum Conference to campus next year. With the theme Intersections in Queerness, this event will bring together students, staff, and faculty from the NY6 Consortium schools to learn from each other. Lavender Graduation, which began eight years ago, has been steadily growing, according to khristian kemp-delisser, assistant dean and director of LGBTQ Initiatives. Each Lavender graduate received a certificate, a ceremonial rainbow cord, a keychain from the Office of Alumni Programs, and a mason jar full of notes of encouragement from community members and peers. “It is a celebration of the whole community,” kemp-delisser said. Colgate’s newest housing accommodations are now home to about 60,000 new residents — honeybees. A collaboration between the university’s food service provider, Chartwells, and a group of students looking to support the local honeybee population led to the installation of two hives in a newly established apiary in the Colgate Community Garden. The new endeavor also resulted in the creation of a student beekeeping club. “In the beginning of the fall semester, I thought it would be a good idea to bring an apiary to Colgate, but it would only work if we had enough students to take care of it,” said Isabel Dove ’19, a geology major from Collegeville, Pa., who is club president and an intern in the Office of Sustainability. Even though Dove has no previous beekeeping experience, she wanted to do her part in supporting the local honeybee population in light of the difficulties bees have been having with colony collapse disorder nationwide. “The beekeeping club, which now has 30 members, will be responsible for the maintenance of the hive and harvesting the honey,” Dove said. This summer, club adviser Ian Helfant, associate professor of Russian and Eurasian studies and environmental studies, has helped care for the newly established hives. Such maintenance is nothing new for Helfant, who operates 10 beehives of his own. 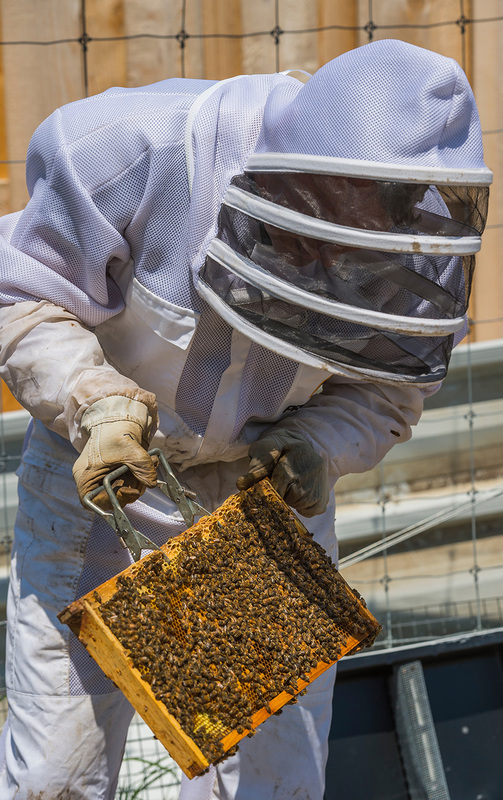 Depending on environmental conditions, each hive has the potential to produce about 40 pounds of honey each year, and club members plan to sell the results of the bees’ labor on campus. The club is also planning educational outreach events to bring in local community members to learn more about the bees and their role in the environment. Colgate has removed the Cutten name from the residential complex located between Whitnall Field and Huntington Gym. Each of the four houses that compose the building — Brigham, Shepardson, Read, and Whitnall — is now known by its existing name and street address, 113 Broad Street. Upon its opening in 1966, the building was named after President George Barton Cutten. Having led the university from 1922 to 1942, he oversaw a building boom on campus, a reorganization of the curriculum, and an increase in the university’s endowment. However, Cutten was also an advocate for eugenics — the belief that a race can be improved through selective breeding — a position widely denounced by scholars and scientists in his own time. “Moreover, research conducted in connection with the university’s bicentennial celebration has revealed that President Cutten took steps with the specific intent of profoundly limiting racial and religious diversity on the campus during his tenure,” Casey wrote in an e-mail announcement to the campus community. In light of this research, the Board of Trustees voted to remove the Cutten name from the residential complex at its April 8 meeting, following recommendations from the faculty, University Planning Committee, and the Student Government Association. Moving forward, a bicentennial subcommittee will be responsible for the creation of guidelines for naming future campus buildings. Before leaving campus this spring, one graduating senior ensured that future generations of students can always find their way through some of the university’s most scenic terrain. Environmental geography major Jenna Lilly ’17, of Miami Shores, Fla., created a new map and signage system for the Harry Lang Cross Country, Fitness, and Hiking Trails, in an effort to help Colgate and the surrounding community utilize the trails to their fullest potential. A few years ago, Lilly and her academic adviser, Professor of Geography and Department Chair Peter Klepeis, were searching for a project that would allow Lilly to use her geography training to benefit the community. The project began with research into existing maps and signage. Weather had damaged maps posted outdoors, and maps online only displayed portions of the trail network. Additionally, trails themselves weren’t marked with a universal signage method. To remedy these problems, Lilly created an updated map using Colgate’s Geographic Information Systems computer lab. The new map contains all of the trails in the network and is color coded. Data for the map came from a previous student’s work and a GPS device Lilly carried as she walked the paths. Additionally, Lilly researched trail signage methods and developed a recommendation for clear and systematized markings along the Harry Lang Trails. Her project has received support and funding from departments across Colgate, including Outdoor Education, the Shaw Wellness Institute, the Office of Sustainability, physical education and recreation, and the Student Government Association. 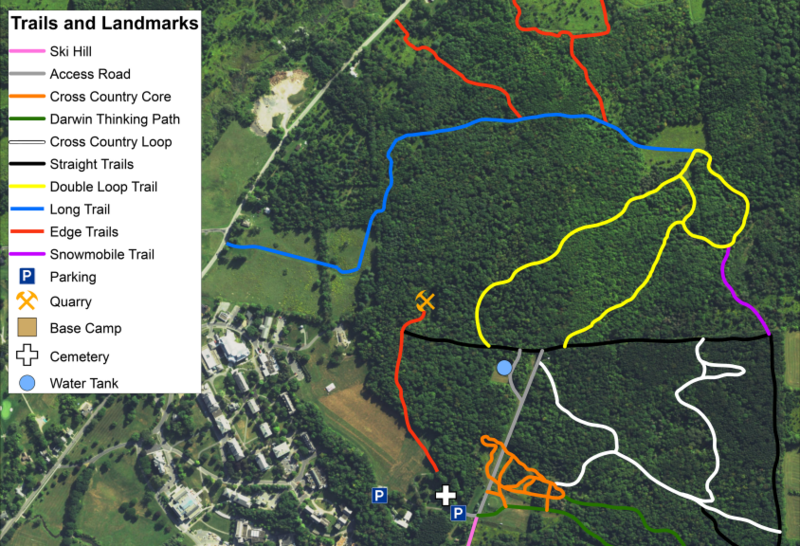 The updated map is now live on the Colgate website, and will be posted at various trailheads. The Harry Lang Trails host a number of visitors, including runners, hikers, snowshoers, and others who want to enjoy Colgate’s 575 acres of central New York woodland. Those wishing to access this pastoral scenery may now do so with greater ease of mind.